Trainer Richard Hannon was wreathed in smiles following the victory of Pether's Moon in the Group One Investec Coronation Cup at Epsom this afternoon. The 11/1 shot was given a peach of a ride by Pat Dobbs, who was riding his first Group One winner, and the pair got up in the shadows of the post to record a neck victory over the 8/11 favourite Dolniya. Hannon was quick to praise Dobbs following the race. "John Manley, the owner, feels the horse goes really well for Pat which is why he rode him," said Hannon. "John has always wanted a good horse, they are very hard to find and that's why people have offered so much money for him. He has really enjoyed this horse - he is on the phone all of the time, he picks a lot of the races himself and Pether's Moon could go to Melbourne but I don't know. "Pat has given him a super ride. He does pull up in front - he did that in Turkey - and Hughsie has ridden some lovely races on him as well but he really goes for Dobbsy. I thought that we were going to be lucky to be second at one stage. "Our jockeys have got big boots to fill next season (due to the retirement of stable jockey Richard Hughes at the end of the season) and we need to have people in place that the owners have confidence in and like and Pat's done his chances no harm at all with a ride like that. 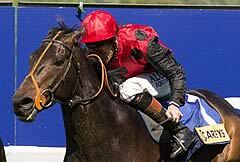 "Pether's Moon has always been a lovely horse. He's been round the circuit a little bit and it's great for Peter and Ross (Doyle) who bought the horse at Fairyhouse for 52,000 euros. "He deserves it. He pulls up a bit in front but he's a horse with loads of ability. I can't explain his last run (beaten 18 lengths into third in the Group Two Jockey Club Stakes at Newmarket in May) which was moderate but we've taken our time with him since then and it's paid off. This isn't something I saw coming so I've not really made any future plans but I'm sure we'll find something nice for him. "Everyone jokes about us not having middle distance horses but we just don't get sent many of them. We try and buy a different sort of horse and this is something that the yard has needed for a while. We can train them over any kind of trip - don't worry about that. We just need the right kit that's all." Dolnyia, the 8/11 favourite, finished second by a neck after being passed in the shadow of the winning post. 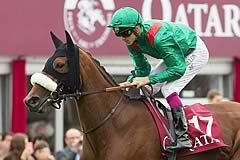 Dolniya, who won the Group One Dubai Sheema Classic at Meydan on her last start, is trained in France by Alain De Royer Dupre, who said: "With four runners you have a tactical race and we had to go in front. The other horse [Pether's Moon] had more turn of foot. "I think Dolniya's next race will be the Grand Prix de Saint-Cloud [June 28]."